"The Mask of Zorro is a sweeping adventure of love and honor, of tragedy and triumph set against the Spanish conquest of Mexico. It's twenty years since Don Diego de la Vega (Anthony Hopkins) fought oppression as the legendary romantic hero Zorro, and now he must find a successor to stop Raphael Montero, the corrupt, once-powerful official who robbed him of everything he loved, and left him to rot in a Mexican prison. Antonio Banderas stars as Alejandro Murietta, a drifter with a troubled past whom Don Diego transforms into the fearless romantic hero he once was. 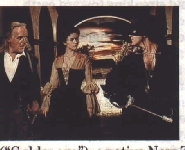 Armed with his mask, sword, whip and jet-black stallion Tornado, the new Zorro embarks on a mission to stop Montero's plot to buy California, set right twenty years of wrongs and at last bring justice to the people enslaved by Montero's greed."